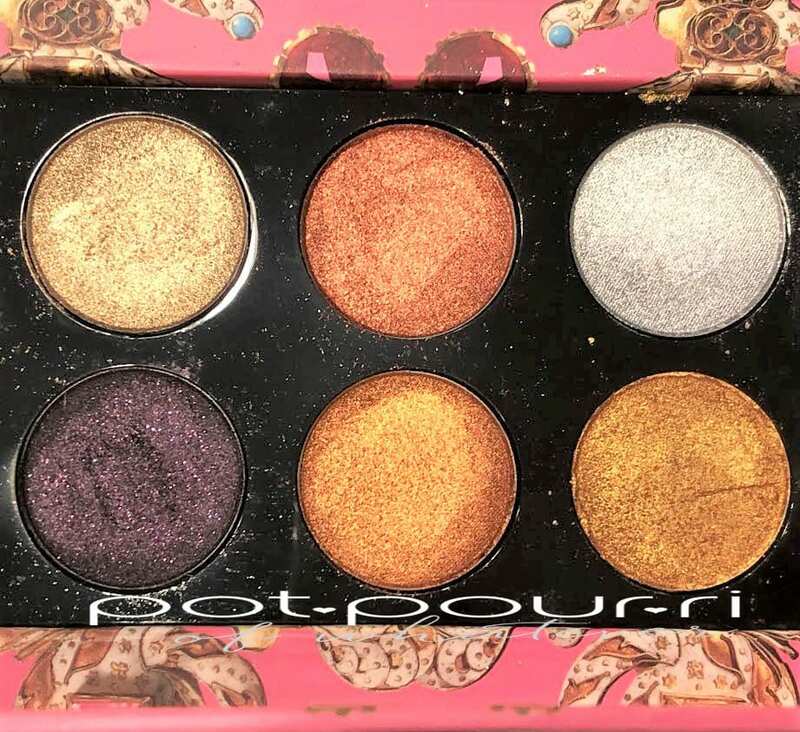 Pat McGrath eye shadow palettes are not your typical palettes. The reason for this is Pat McGrath is not your typical makeup artist. Instead, Pat is the Mother makeup artist of high fashion. This year, the limited edition Holiday 2018 collection is called Opulence. 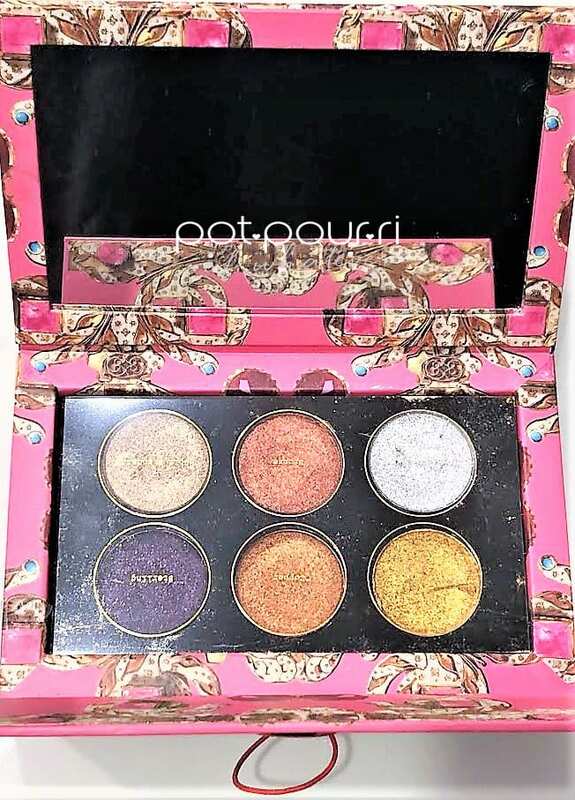 Moreover, the Opulence Collection includes three Pat McGrath MTHRSHP Mini Eye Shadow Palettes. Furthermore, each palette has six shades. Completing the holiday collection are Matte Trance and Opulence Blitz Trance lipsticks. You can find the Mini MTHRSHP Palettes, and the Matte and Opulence Blitz Trance Lipsticks at Sephora, and on Pat McGrath Labs Website. Each mini palette retails for $55. Also, the lipsticks retail for $38. To begin with, Opulence is the key word to describe the gorgeous packaging for the Mini Eye Shadow Palettes and the Lipsticks. First, I love the painted jewels and gemstones on the mini palettes. 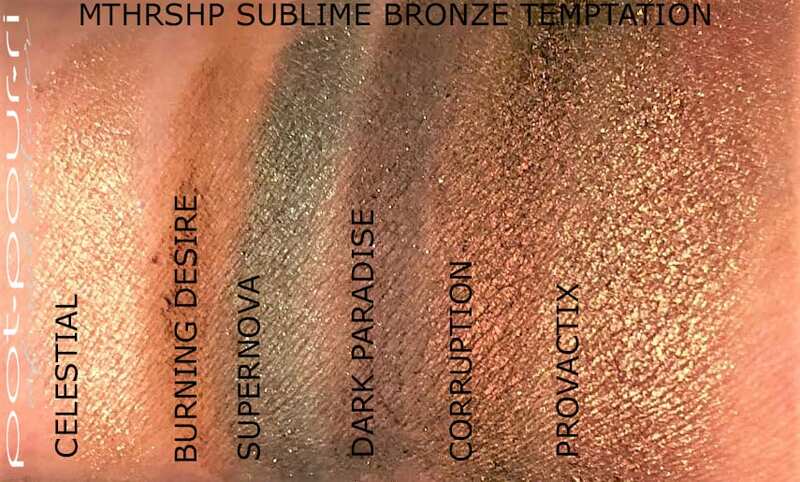 The two palettes I have are Sublime Bronze Temptation, and Subversive Metamorphis. Each of the palettes has six eye shadows on one side and a nice sized vanity mirror on the other. To start with, the mini palette comes packaged in a chic envelope. I love the red string that wraps around two round circles to fasten the palette. Furthermore, the envelope is made from thick cardboard. It is painted ruby red. In addition, it has rubies encrusted in gold painted all over the envelope. Next, the Subversive mini palette is also a chic envelope. However, this one is painted in sapphire pink. 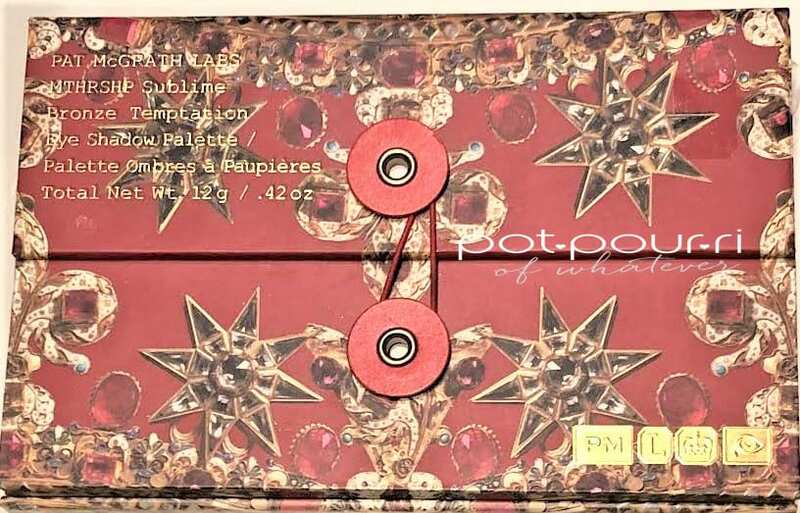 In addition, it has pink sapphires encrusted in gold painted all over the envelope. The word glitzy describes the outer packaging of Blitz Trance. It is a metallic glittering gold box. Also, the tube is also glittering gold metallic. 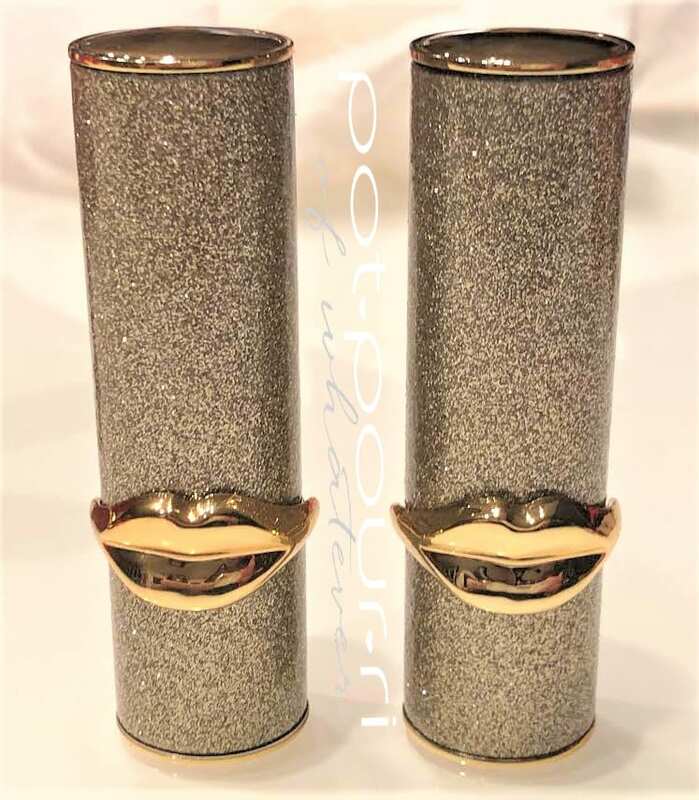 Furthermore, the iconic gold lips on the tube is where the cap separates from the bottom of the tube. 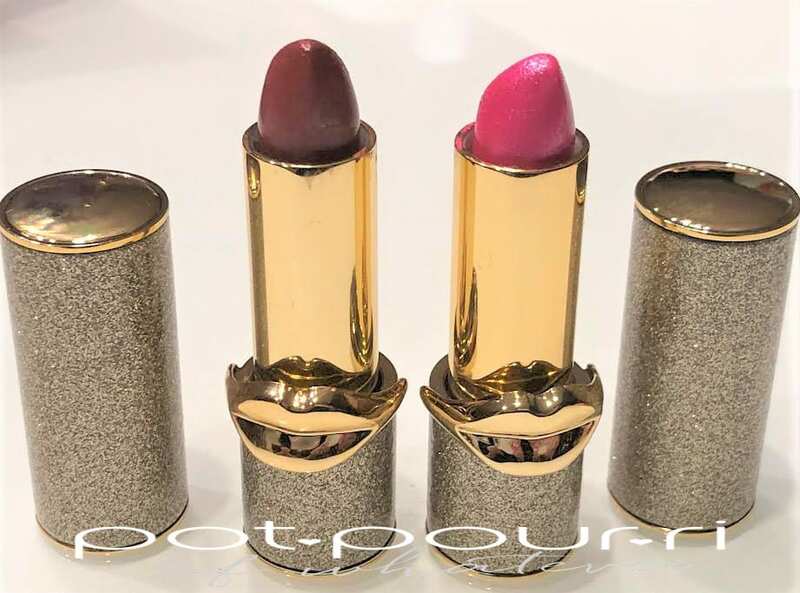 Simply turn the bottom so the lipstick bullet goes up or down. Each Matte Trance Lipstick comes in a rectangular case that has the same string closure as the mini palettes. Also, they have the same design as one of the three mini palettes. 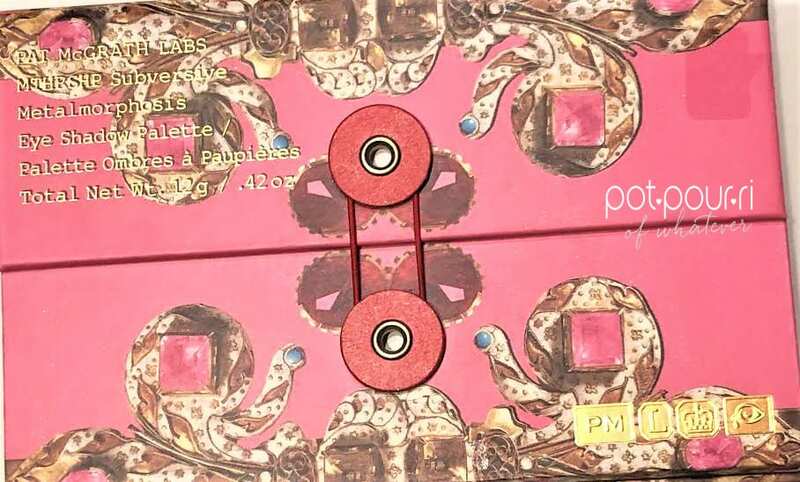 For example, the pink sapphire mini palette is pink, designed with pink sapphires encrusted in gold. Also, the lipstick tube is sapphire pink. I chose a Matte Trance lipstick in the ruby red box. 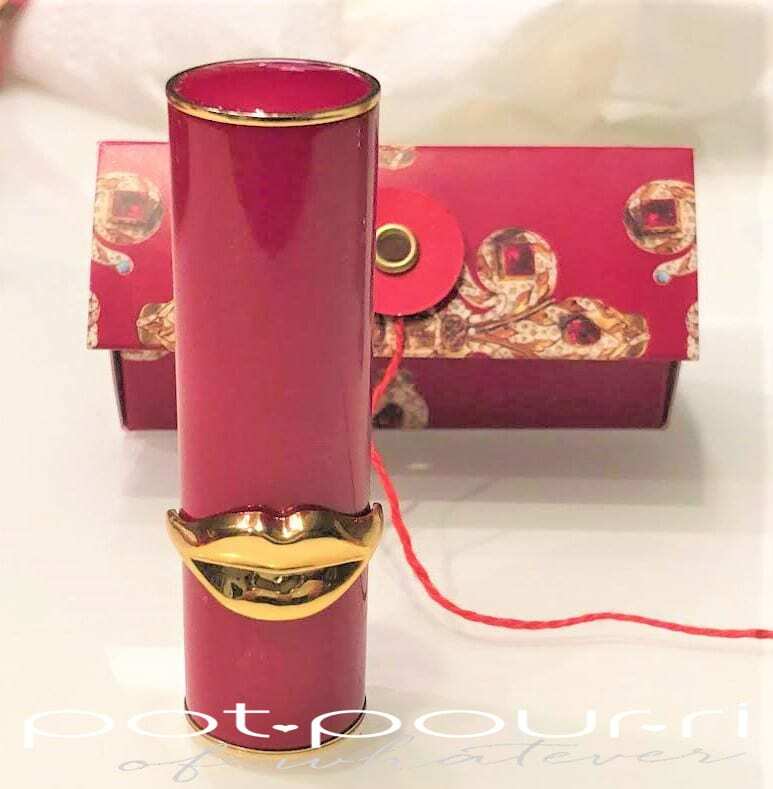 Moreover, it is in a ruby red tube. 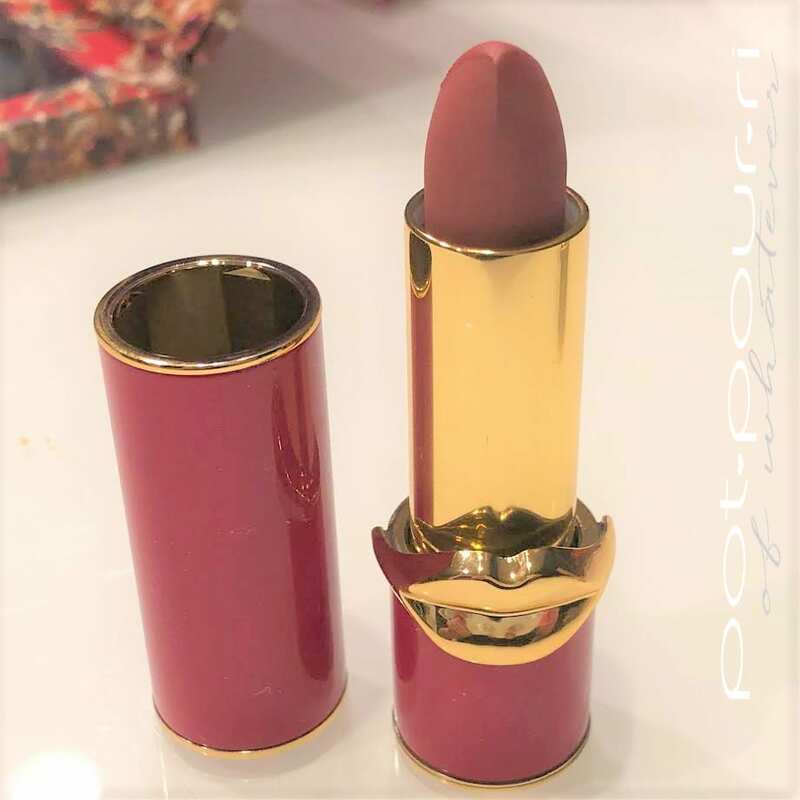 Although, the lips that adorn the tube, and connect the top to the bottom, are still the same gold as all of Pat’s lipsticks. 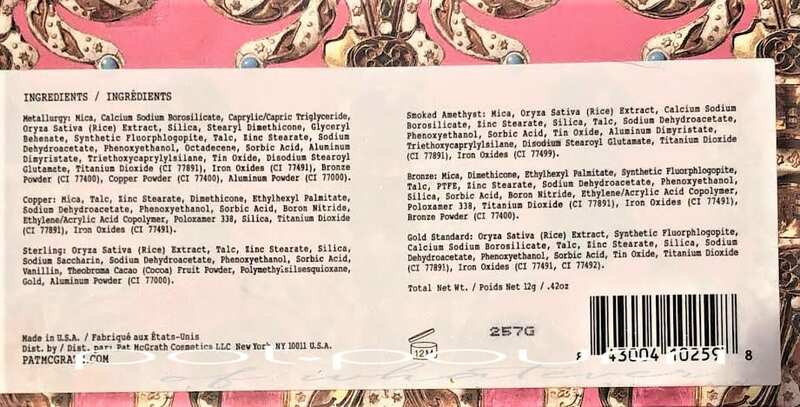 One thing everyone can agree on, Pat McGrath makes a state of the art formula. First, the pigments make bold, vivid, one-swipe eye shadows. Therefore, each shade gives an opaque finish. Additionally, the texture of the shadows feels like butter. And, the shadows are super easy to apply. Moreover, they blend so easily that a beginner can apply them. As a result, the shadows do not make a mess when the shades are blended together. Finally, the special effects shadows are stunning, reflective, magical and super shimmery. First of all, I love the full, opaque coverage of the Blitz Trance Formula. Next, the formula is ultra-reflective because it has pearl pigments. Also, it has hydrating ingredients. 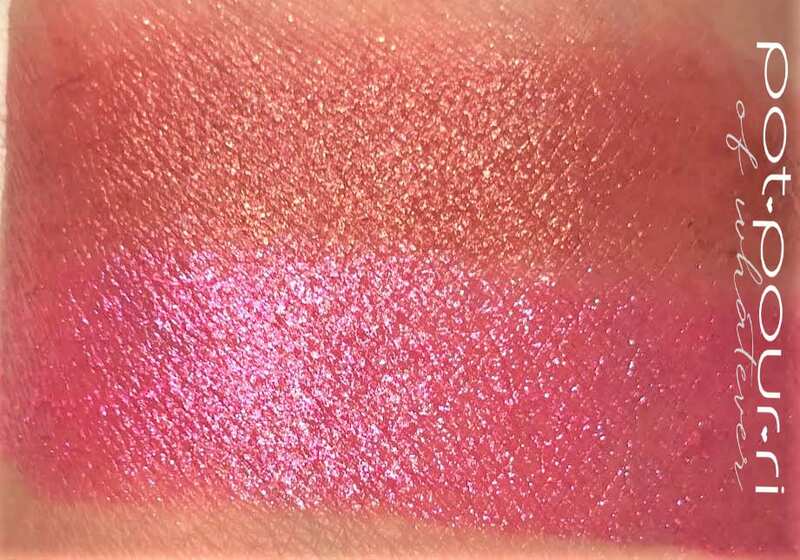 Also, the lipstick is illuminating, iridescent and it gives you multi-dimensional color. The Blitz Trance lipstick formula has a velvet matte texture. Also, it has highly saturated pigments to give a strong matte finish. Also, optical diffusers blur the look of imperfections. Last, spherical particles help create a creamy, soft texture for your lips. First, Celestial is a luminous shade of champagne. I would wear this shade as a highlighter. Next, Burning Desire is a terracotta shade with a matte finish. I love this shade in the crease, or as a liner. Then, the star of the palette, Supernova, is a sparkling emerald green. I love this shade because it is the most Christmas-like. I’d wear this on my eye lids to make a Christmas Statement. Next, Dark Paradise is a noir-tinged brick red. Wear this on the outer corner of your eye. Then, Corruption is a bronzed burgundy shade in a duo-chrome finish. I love this on the eye lids. Last, Provactix is a golden bronze duo-chrome. I love to wear the duo-chromes so that you can really see the color change. Therefore, I wear them on my eye lids. First, Metallurgy is a forged gold metallic shade. Next, Copper is a vivid metallic copper. Sterling is an ultra-metallic shade of silver. Also, Smoked Amethyst is a pearlized purple obsidian shade. Bronze is a blazing metallic bronze. Finally, Gold Standard is a gleaming 24 Karat Gold. Be daring and wear all of these metal shades on your eye lids. Create the look of a molten metal finish. Fuchsia Perfect is a bright pink shade with a blue and pink pearl reflect. Flesh Fatale is a bronzed rose shade with golden pink pearl reflect. Omi 107 is a mid-tone rose shade with a matte finish. The eye shadow palettes are great for the Holidays. First, the pigments in these shades is incredible. Next, the formula is smooth and buttery. The color payoff is intense. Finally, it is Pat McGrath at her finest! Wear them for the holidays. 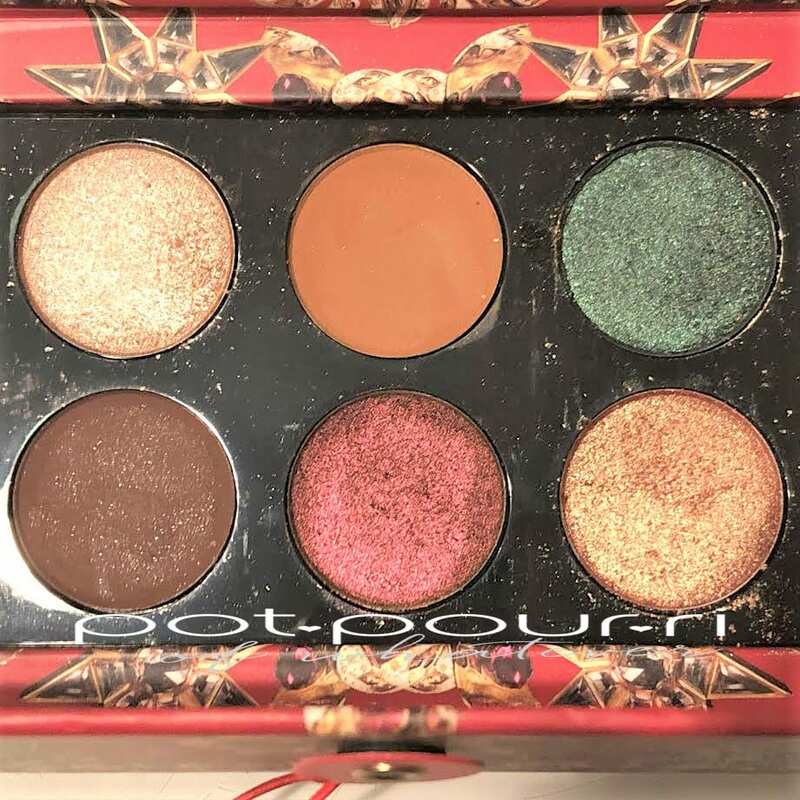 I love the warm metallics, the shade-shifting jeweled tones, and the tawny mattes in the Sublime Bronze Temptation Palette. These shades are very glamorous. 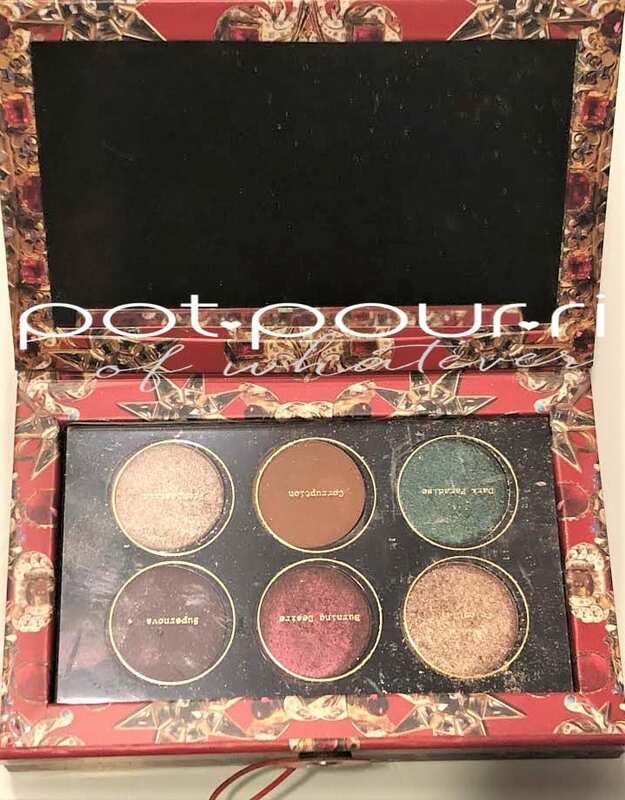 The Emerald Green makes this palette scream Xmas!!!!! 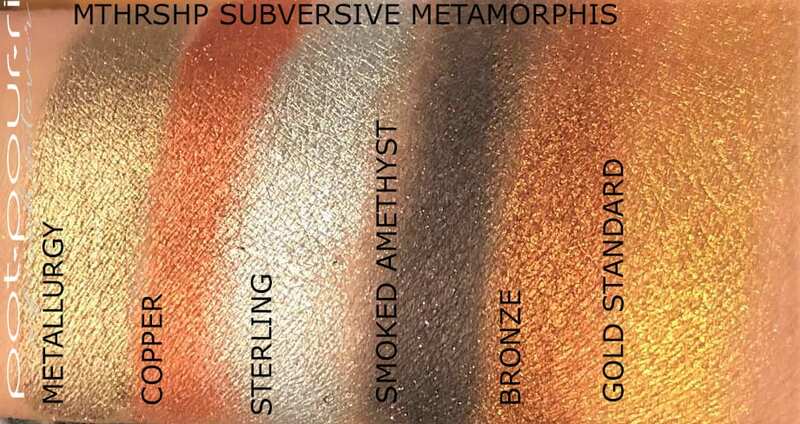 Furthermore, the Heavy Metals meets Glam Rock Subversive Metamorphis palette gives you all the foiled looks you’d ever need. 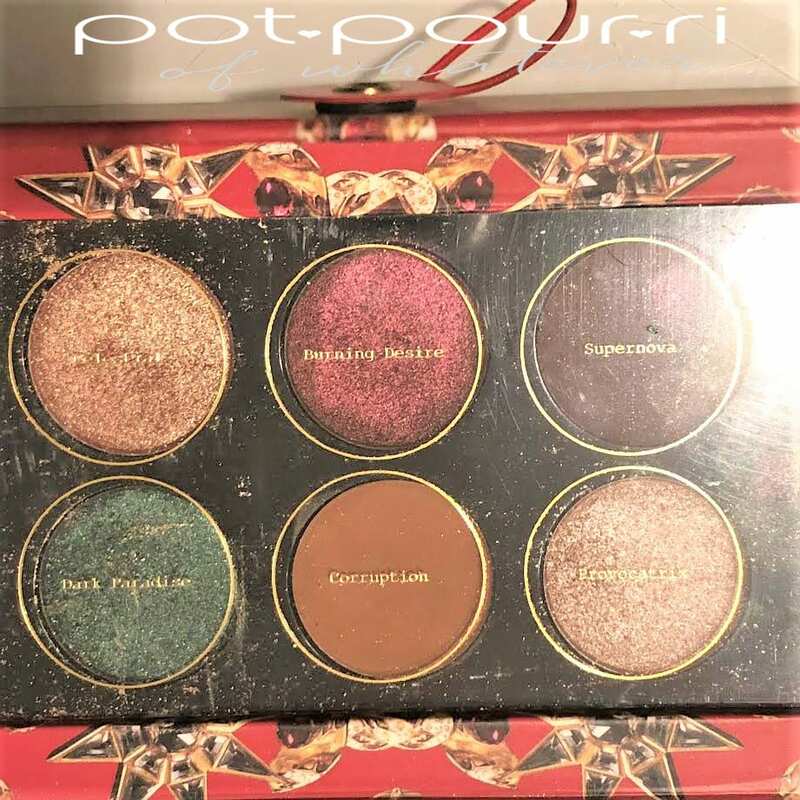 And, you get the foiled look with just one swipe This palette is a real party animal. It screams New Years Eve Party, night clubs, and discos. Also, I love the velvet matte texture you get with the Matte Trance Lipstick. It also goes on with just one swipe. In order to choose, It just depends on how you feel at the moment. Honestly, if I were gifting this, it would be to someone special, someone who loves makeup, and appreciates luxurious , outstanding shades and textures from the best makeup artist in the world. (I am her biggest fan!) Let me now what your thoughts are with this awesome Opulence Collection For the Holidays in the comments below.